We recently decided to add a second coop, this one in the goat pasture. We plan to use the new coop as the primary one and the existing coop as the home for chicks/pullets or any sick hens we might have. 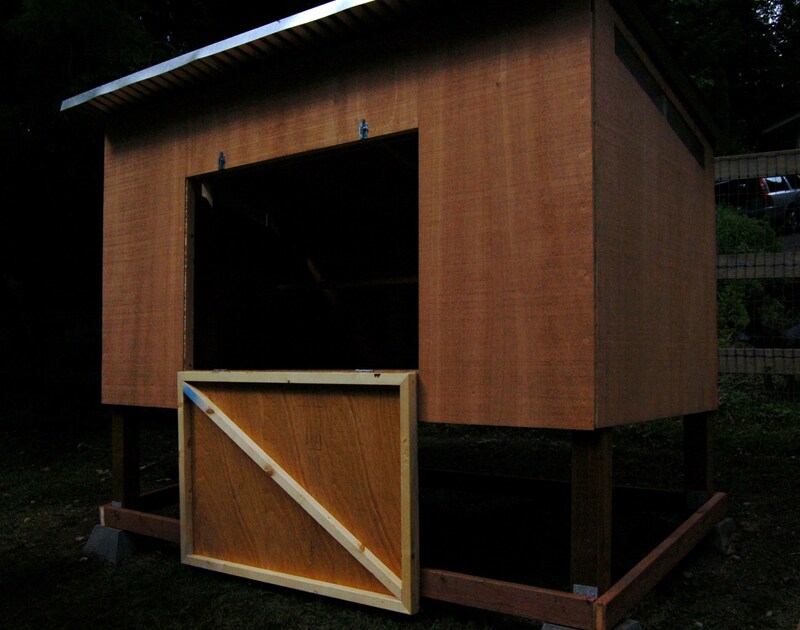 Derek and my brother-in-law Jeff Paquette built the coop this weekend. Jeff is a professional builder who does all sorts of building projects. Although he primarily does home remodels, he does do the occasional small project such as our coop or a custom closet installation. His email is hammerhandllc@comcast.net if you are local to the Seattle area and need a good builder. This is one heck of a sturdy coop. We expect it will last many years. And here is my long-lost friend. I hope she stays awhile. This entry was posted in Homesteading, Livestock and tagged chicken coop, sun. Bookmark the permalink. Sandy, I used to live with your brother in law and another friend years and years ago! What a small world it is. I hope he and family are doing well! Does he still have that great mustache? Beautiful new digs for the chickens! Your brother in law obviously did a really nice job. We enjoyed the surprise sun appearance today too! We went to Point No Point for a beach walk – expecting to get rained and otherwise brave rather miserable weather. While it was blowing quite hard, the sun came out and it was actually quite pleasant out! When we got home it was still sunny and we took advantage of it while it lasted and sat on the deck for a while and just relaxed/visited. The sun was amazing when it appeared, so unexpected. Hope it stays a while too.